Life of Miss Sunshade - The Vancouver SuperDALE: What's more stubborn than an Airedale?? Sunshade had an ACTH stim test + CBC done yesterday and I would really appreciate it if you could help me understand what is going on here. My vet has faxed all the results to the internist, and we're waiting to hear back. We started Sunshade (70 lbs) on 30mg Trilostane BID last Wednesday (December 8th). So far, I have not seen any reduction of the Cushingnoid symptoms. We have never had a regular ACTH Stim done before. We've always done the U of Tenn panel as we thought Sunshade was Atypical. Prior to seeing the internist, we had an LDDS test done that showed inadequate adrenal suppression in response to dexamethasone - is supportive of hyperadrenalism. I think our ACTH Stim units are international units, so I'm not quite sure how it compares to the US values. However, it looks like pre and post are both normal? So shouldn't her symptoms be better? Is Trilostane the wrong drug for her due to her being a true Atypical dog? (12/08/10 - 30 mg Trilostane BID. Denamarin, PolyMVA, IP6, Fish oil, Vit-C,E,B, probiotics, Syn-flex, CoQ10, Selenium, digestive enzymes. All the extra information below the signature line is required so the list members can get a clear picture of the health concerns, diet, weight of the dog, and all the medications and supplements the dog is currently on. It allows members to get the general info and better them to help one another. Last night, mum posted the message below to the Cushing's group. You can see the subsequent responses below. Title: [CCAC] URGENT: Trilostane safe for stupid human? My boyfriend ate Sunshade's Trilostane (45mg) by accident and he refuses to go to the ER no matter what. He told me he'd go if he starts having diarrhea, vomiting, lethargy, inappetance. Basically not taking it seriously and reciting to me everything I had asked him to keep an eye on Sunshade for. Any doctors on the list? I called local animal ER and they told me they weren't sure and to just go to the ER. I usually take all his supplements out and put them on a plate. 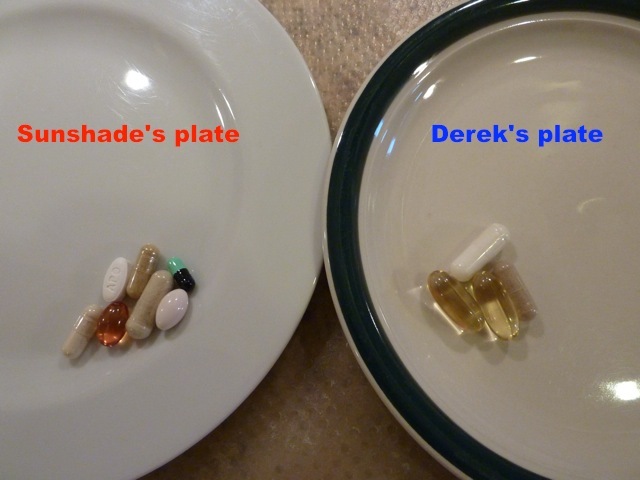 Tonight I prepared all of Sunshade's pills and put them on a different plate. He ate Sunshade's plate. I have no idea why, the pills look completely different and Sunshade has more pills. He's 31 with no known health issues, although he does have a Cushingnoid belly and insatiable appetite. Goodness I don't know whether to laugh or be serious...!!!!! But one thing I do know a Dr's opinion and evaluation are in order immediately...I dont think it is anything to play around with.. I agree with you Judy, I just don't know how to get him to GO. He thinks Sunshade is only 70 lbs, so he should be fine. I saw the below info when I googled and showed it to him and he still wouldn't go. Said those side effects were ok. I am so frustrated (and a little bit worried..). I need a tranquilizer and a moving company. Taking Trilostane is proven to result in unwanted, adverse side effects which is why it should never be used in humans. Some common side effects associated with Trilostane use were: stomach pain, cramps, diarrhea, achy muscles, bloating, dizziness, fever, flushing, nausea, headache and watery eyes. In rare cases, some patients experienced darkening of the skin, drowsiness, loss of appetite, depression, vomiting or skin rashes. Treatment for canines resulted in reductions of cortisol and aldosterone. Use also commonly results in polydypsia, polyuria, panting, polyphagia, improved skin conditions and coat quality. As a disclaimer, this isn't medical advice for your boyfriend. However he is unlikely to suffer any ill-effects from one Trilostane tablet regardless of dose. If he makes a habit of it I would suggest behavioural training! Oh thank you thank you!! I'll consider taking him to Cesar and putting him in with the pack. Well now there you go, everyone can have a good nights sleep, With the GP's comment, however I do think she hit it right on the mark of doing some Behavioral training, and I would get and appt with Caesar as soon as possible...if he doesn't want to go, get one of the pronged choker collars and the leash and do some correcting.. I just want to ease you remind about a couple things since boyfriend is reluctant to go to ER. Although the package insert reads not for human use, Trilostane was originally a human medication, used for Cushing's as a bridge therapy until surgery was or other treatment corrected the condition. It was withdrawn from the (US) human market in 1994. From the bowels of archived drug info- For humans, an initial starting dose was 30mg,4x daily; adult prescribing limits Up to 480 mg per day. Winston: 13 yo, CKCS, dx 12/07, atypical, previously rx w/ Trilostane-> elev secondary hormones, now rx w/ Lysodren; 11/09 dx degenerative MVD, on Benazepril, Pimobendan, Furosemide; also on Ursodiol, Melatonin, flax lignan extracts, SamE, milk thistle, ASA, monthly testosterone inj for hormone-responsive incontinence. his place. "Honey, remember the time you ate the dog's medicine?" Management is very important in preventing counter surfing, so perhaps you could gate off kitchen from boyfriend, until after Sunshade has taken meds. Or alternatively, you could teach him a go-to-couch cue to keep him out of the kitchen. While Trilostane or Lysodren may help my pot belly, thinning hair and frequent urination, it is not on my list of things to do today, yet I want to say in Elaine's Boyfriends defense that things happen. There is no such thing as a stupid human, just one that is ill informed...perhaps even ill trained, but just the same, I have come close to making the same mistake myself, mostly during holidays when I feed Gremlin from a plate instead of her bowl. Get distracted from a phone call or a knock on a door...it is easy to make a mistake. Gremlin has her own plates because last Christmas I couldn't remember what dish I put the phenylpropanalopene in and her antibiotics. I had to toss some food. Good thing there was no Eggnog that day! I wouldn't be concerned unless he starts scratching behind his ear and turning around three times before he sits down. Mum's response to all those helpful hoomans. Thanks for all your support and input regarding the issue at hand. Boyfriend DID wake up this morning, and he is fine. He did pull the "hmm.... I don't want breakfast, I'm not hungry......" trick on me, but managed to finish 4 pancakes and some scrambled eggs in about 5 minutes. Now that I know he is going to be ok, I will put some of your training suggestions in practice. A friend of mine suggested neutering as that made her male dog obey better. I think that is a little extreme for now, but will keep it in mind as last resort. We have started training this morning. The lesson was how to tell the difference between the plate of pills that's left on the left hand side of the sink from the other plate left on the right hand side of the sink. (Refer to picture attachment). He paid attention, but I think it's going to take a lot of practice before he masters it. I will also work on the Go-To-Your-Couch command as I can see that being quite useful in many circumstances. @ Denis: LOL! I understand accidents happen, the "stupid human" part was for the fact that he refused to go to the ER with me in situations like this. He was busy playing World of Warcraft online. I did disconnect his computer, and he saw that I was really mad, so he went and made me TEA and SNACK and offered to give me a massage but still refused to go to the ER!!!!!! Again, thank you to all that responded. PS gremlin comes first in the signature as she seems to be the one that keeps me on track. That's about it for now, hope you guys had a great weekend!! Oh what an awesome post! Let me know how the behavioral modification works. While counter surfing is not an issue here, I could use some help with "put your toys away" as in "why is there a bloody wetsaw and air compressor in the middle of my work out area?" OMG, mom is laughing so hard that dad is telling her to please be quiet - he can't hear the stoopid football game! Gosh, Sunshade - your pills look nothing like D-guys! BOL!! This is hilarious! Remember to post a video of D-guy going through training!! Way to funny...our mum is still laughing...what a great story this is going to be for years to come...to too funny!!! Bwaaaaa ha ha! Oh, I'm suffering tears of mirth! Thank you, Stupid Boyfriend, for my evening's entertainment! Sunshade, i'm glad u are on the path of finding a solution to ur cushings. Dora is sending good vibes ur way! Ps: just took my stubborn grandpa to the emrgency, i caught his early signs of resp distress; after xray, blood work(results ok), ecg (results ok), Dr did find pnemonia. Gladly, i followed my instinct n common sense, instead of taking grams to walk in clinic, took him straight to ER where theey hav better resources n knowledge base to treat him early. My point is, dont hesitate to get help if u spot something is wrong, gettting checked by professionals even for swallowing a dogs pill is necessary. After seeing the dr and the results r okay, worse case scenario is just getting pass someone elses judgement. But not going to seee the dr and if the med side efects were life threatening, worse case scenario is when the drug does get absorbed and with time it gets meetabolized by the liver... It might b too late for any intervention and dguy may not wake up the next day. I hope d guy will consider seeing the dr if it ever ever happens again! Touch wood! He's turning into a dog. There was a night here when I came home and couldn't find the boiled rice and beef for the nauseated terriers. Yes, John thought it was his dinner. And he ate it. No salt, spices, nuthin'...he said it didn't taste any different than my usual cooking. OMG... Elaine, I was trying to control my laughter and yet at the same time freaking worried for the poor '31 yr old, un-neutered' male. Good to know that all's fine at the end of the day.. Umm from my experience with guys, I think there's still a chance that he will confused his plate with Sunshade's, so to keep it as simple as possible for him, I suggest you use a mug for him so he can clearly see the difference!! Ehhh.. and yes, I think it's time to call Caesar... or you can muzzle him until Sunshade has finished taking her pills. Usually when I read a post with tears running down my face, it's for a sad story. In this case, I was laughing so hard as the tale evolved the tears just started. Elaine, that would be really funny as a made-up comedy routine, but knowing that it's true ... PRICELESS!! Thanks for sharing! Great story! You got me smiling! That was really funny because it turned out well. But seriously, get some pill containers and use them! Mama gets the kind that hold pills for a week, morning & evening doses. They also make them for taking pills up to 4 times a day, for a week. Then write each person's/dog's name on their container and NEVER put pills on a plate! We have one container for every person/dog in the house. Works great, never any confusion.